Today's anniversary of the Swift Raids, known as the 9/11 for migrants, is a reminder that terror and torn apart families have become the new normal. On the day of the Swift raids, more than 300 U.S.-born children came home to find at least one of their parents gone. Seven years ago today on a crisp December morning, 1,300 undocumented people were arrested in the biggest immigration raid in the history of the United States. The raid, also known as Operation Wagon Trail, targeted six different Swift & Co. meat-packaging factories in Iowa, Minnesota, Texas, Colorado and Utah. At 7 a.m., 1,000 ICE agents and local police armed in riot gear stormed into the facilities. Yelling at workers to line up, the police began dismissing ones that appeared to be U.S. citizens. Police gathered the rest and started handcuffing and shouting orders in a language that many of the workers didn’t understand. Hours later, they were forced onto buses without being told what was happening or where they were being taken. The workers that were detained disappeared for three weeks. They weren’t allowed to contact their loved ones. Families within the community were confused. Fearful parents pulled their children out of school after rumors spread that ICE would target them next. Families fell further into poverty after losing a portion or all of their income. Prominent community leaders spoke out against the way the raids were handled, saying the worst criminals receive better treatment than immigrants. Many within the migrant rights community compare the raids to September 11. The raids in Operation Wagon Trail marked the beginning of a new era with immigration enforcement, setting off a wave of more frequent and violent deportations. Seven years later, with an average of 1,123 deportations each day, the fear sparked by the Swift raids has become an everyday reality for migrant communities. 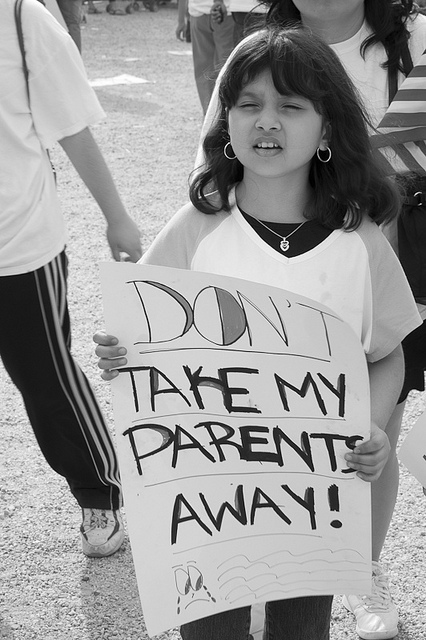 A recent study by the Human Impact Partners wrote that the record high deportations under the Obama administration, combined with Congress’s flip-flopping on immigration reform, “affects the mental and physical health of five million American children.” These are U.S.-born children who, despite the fate of their parents, will grow up as citizens. They will become parents, lawmakers, teachers and neighbors. What affects their health today will continue to present itself in the nation’s future. In the last year alone, 150,000 U.S.-born children have been separated from at least one parent, according to the National Council of la Raza. A majority of them are under the age of 10. Children aren’t the only ones who suffer. Spouses of people who are deported live shorter lives. Local businesses lose customers. Communities are drained of valuable members. There are 11.7 million undocumented immigrants in the United States who could face deportation any day. One of these families whose story I’ve been following for a number of months is the Canenguez family in Tremonton, Utah. The mother, Ana, was born in El Salvador and migrated to this country in 2003 to earn money for her children’s education back home. Recently Ana and her four children, who followed their mother north to escape death threats from gangs in El Salvador, were ordered to leave the country within the next 120 days. If the family is forcefully removed, Ana would leave behind her two U.S.-born children and husband. Desperate not to be ripped away from her youngest children, Ana, along with help from the Salt Lake Dream Team, is applying for prosecutorial discretion, which would allow the family to stay in the United States. She is submitting the application publicly on Thursday, the anniversary of the Swift raids. “We stand in solidarity with Ana, the Swift workers, and behind all immigrant families who continue to be victims of the policies and actions of the U.S. in our native countries that make our migration inevitable,” explained Itza Hernandez of the Salt Lake Dream Team at the rally and vigil Thursday. According to the mainstream narrative, deportations are the end of the story for people like Ana. However, as a result of the United States’ continued economic and environmental exploitation in the Global South and the increasing number of parents divided from their children, reentry has become the new normal. Even as early as 2006 when the Swift raids occurred, 50 percent of the workers that were deported later reentered the United States to rejoin their families. This often invisible reality, that continues despite billions spent on militarizing the border, challenges the sensibility of such ruthless deportation policies. Politicians from both parties use the tragedy to gain support. One side is pushing for comprehensive immigration reform in an attempt to try to lower the number of deportations. The other side demands that we strengthen boarder security in order to stop the influx of migrants. Both parties miss the point. Neither immigration reform nor boarder security will stop migration. This truth is one that we hear each time migrant families block a road, stop a bus or lock a gate to demand not only an end to deportations, but also an end to U.S. interference in their home countries. We need to tackle the root of the U.S. policies that affect the climate, economy and quality of life within the Global South. Until then, we will be constantly forced to relive traumatic events like the day of the Swift raids. Waging Nonviolence is proud to co-publish articles with The Youngist. “We stand in solidarity with Ana, the Swift workers, and behind all immigrant families who continue to be victims of the policies and actions of the U.S. in our native countries that make our migration inevitable,” explained Itza Hernandez of the Salt Lake Dream Team. This seems to indicate that immigration issues (whether in the US, Europe, Australia, or other places) are tied to the concentration of political and economic power, whereby big corporations control governments.